Anupam Kher will succeed the controversial Gajendra Chauhan, whose appointment in 2014 had triggered widespread student protests, as FTII chief. 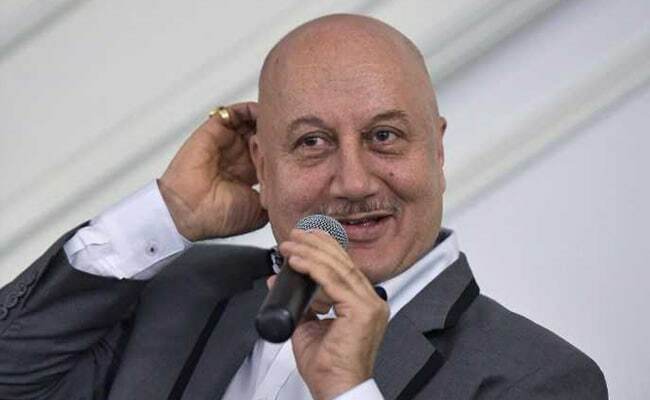 Mumbai: Anupam Kher, the newly appointed Chairman of the Pune-based Film and Television Institute (FTII), says he will work towards sharing his experience with students rather than setting agendas as an administrator. In an interview to IANS in Mumbai, Mr Kher, 62, said: "I'm happy and humbled to facilitate students with my 40 years of experience in Indian and international cinema, travel, stage acting and everything. I think sharing experience adds up to perspectives and that's what I want to do." Mr Kher's appointment as the FTII chief was announced on Wednesday. He will succeed the controversial Gajendra Chauhan, whose appointment in 2014 had triggered widespread student protests. "I would love to facilitate students rather than setting agenda like an administrator. I want to interact with students to understand their requirements, and along with faculties, I would be helping students for their betterment," said Mr Kher, a vociferous BJP supporter. Mr Chauhan completed his tenure in March. Mr Kher had said when Mr Chauhan was appointed that the FTII needed a person with much more qualifications than Mr Chauhan had as a producer, director or actor. Now Mr Chauhan, in reaction to Mr Kher's appointment, told IANS that FTII needed a good administrator more than a good actor. Asked about it, Mr Kher said: "See, it is not dignified to comment on someone's words that he said in a certain context. I think it is a great honour and a great sense of responsibility as well. I am a son of a government clerk who came to Mumbai with 40 rupees in the pocket. Today, whatever respect I have has been earned through my hard work and blessings of the Almighty, I couldn't have asked for more. So, I am content." The National Award winner, who began his acting career with "Saaransh" in 1984, has a vast repertoire of over 500 films. Some of his Hindi films include "Karma", "Daddy", "Lamhe", "Dilwale Dulhaniya Le Jayenge", "Kuch Kuch Hota Hai", "Maine Gandhi Ko Nahin Mara", "A Wednesday" and "Baby". He has also worked in international projects like "Bend It Like Beckham", "Bride and Prejudice", "Speedy Singhs", "The Mistress of Spices", "Lust, Caution" and the Academy Award winning "Silver Linings Playbook". He has also appeared in several stage plays and authored a book, "The Best Thing About You Is You". Earlier, Mr Kher served as the Chairman of the Central Board of Film Certification (CBFC), and from 2001 to 2004 he was the Director of National School of Drama, from where he had passed out as a student in 1978. Anupam Kher also has his own acting institute Actor Prepares. He was honoured with Padma Shri in 2004 and with Padma Bhushan in 2016 for his contribution to the field of arts. The actor is all for formal training in the craft. "There is a training process that one should go through to learn the craft. I have been running an acting school for 14 years, and I think I have survived in the entertainment industry for 40 years because I am a student of National School of Drama," he said. Over the past few days, Mr Kher has been busy promoting his production "Ranchi Diaries", and he has also has film projects lined up. Will his new responsibility as FTII Chairman affect his film work? "No, no. I am an artiste and nothing is going to change on that front. This is not the first time I am handling an administrative post. I was the Chairperson of National School of Drama as well. My job is not sitting in the office but working on ideas and I can handle that easily. My film, my theatre, shows, everything will be going simultaneously. You see, my grandfather used to say, 'A busy man has time for everything'," he said.